If you have ever owned a Garden Tractor Scraper Blade, then you know how useful the can be. On the other hand, if you are here in search of the best garden tractor scraper blade you can buy then you are in luck. Haven’t made up your mind and looking for more information then let me see if I can help. To start with garden tractor scraper blades are pretty simple and basic design as there’s not much to look at. You’ve got the hitch, a shaft and a blade seems easy enough right? Well, there’s a few other things such as the cutting edge, angle degrees, and directions, types of welds, size and weight, even a parking stand for some of the tractor scraper blades. Are you looking To Buy A Scrape Blade? What are your thoughts? The great thing about tractor scrape blades or and scrape blade for that matter is the fact they can be used for some different tasks. I’d say for those living up north who receive a lot of snow use it mainly for scraping snow. A tractor scraping snow sure beats shoveling it. Scrapping driveways, in general, are one of the most common methods for a tractor scraper. Smoothing and filling in puddles is the perfect job for this type of tractor attachment. Pushing or pulling brush into brush piles and clearing storm debris are also great uses. Spreading mulch in the springtime or dirt piles to level out some low spots are simple tasks with the help of a scrape blade. There are, scraper blades for tractors, but there is also scraper blades for lawn mowers, scraper blades for ATVs, and even scrapers blade for snow blowers. Then you have the verity of styles such as a garden pull-behind scraper also known as tractor rear scraper blade or a tractor supply box scraper. When times get tough people even make their own homemade garden tractor scrapers. For this article, we will stick to the tractor and mower scrapers. Okay, so you get the idea and know just how useful a scrape blade can so let move on to list a few of our top choices for tractor scrape blades. These include subcompact and small compact tractors such as the Kubota B Series attachments. Behlen Country Sub Compact Grade Blade isn’t a bad choice either. If you are mainly moving snow, this will make a great blade. However, there are a few things that worry us if you plan to move massive piles of dirt or gravel. The hitch design looks as if it’s a weaker design. I also don’t believe the blade has an offset which a lot of people don’t mess with anyway. The Cadillac version of scrape blades is the Land Shark Delux Scrape Blade with Hydraulic Options. This does require a bigger tractor and more horsepower because this thing weighs 785 lbs. It’s compatible with a category I & II quick hitches and 3/8″ thick moldboard. Tilting and angling the blade without having to get off your tractor thanks to hydraulic options would be well worth it. Did I mention it can be converted into a landscape rake as well (with the right choices)? It’ not cheap but I’d have to say it’s the kind of scrape blades. Are you looking for a scrape blade to fit a lawnmower? We’ve got a few we picked out but always remember to double check to make sure the one you want matches your lawn mower. I don’t know of any scrape blade that is a one fit all. 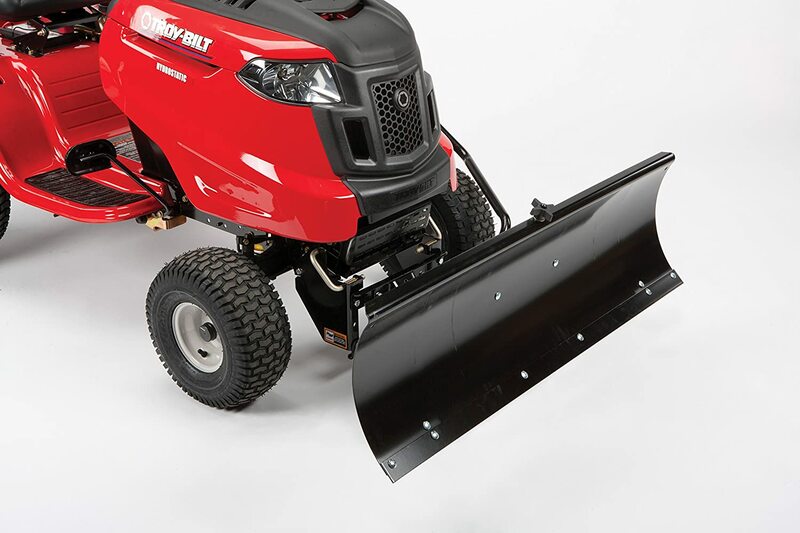 One of the highest rated lawn mower scrape blades is the MTD Genuine 46 Inch Snow Blade Attachment on Amazon. It’s got a spring-loaded blade return and adjustable skid shoes. You can manually adjust the angle to a 25 degree left or right adjustment. Lots of satisfied customers commenting on how easy it was to put together and how well it works. Clearing snow as long as you have a place to put it, wasn’t a problem. One customer used it to level gopher mounds while mowing while another used it to spread gravel in their driveway. There were a few complaints about missing parts and how the instruction manual wasn’t easy to follow. Who reads instruction manuals anymore, just Youtube it. It’s a great buy if you are looking for a lawn mower scrape blade. 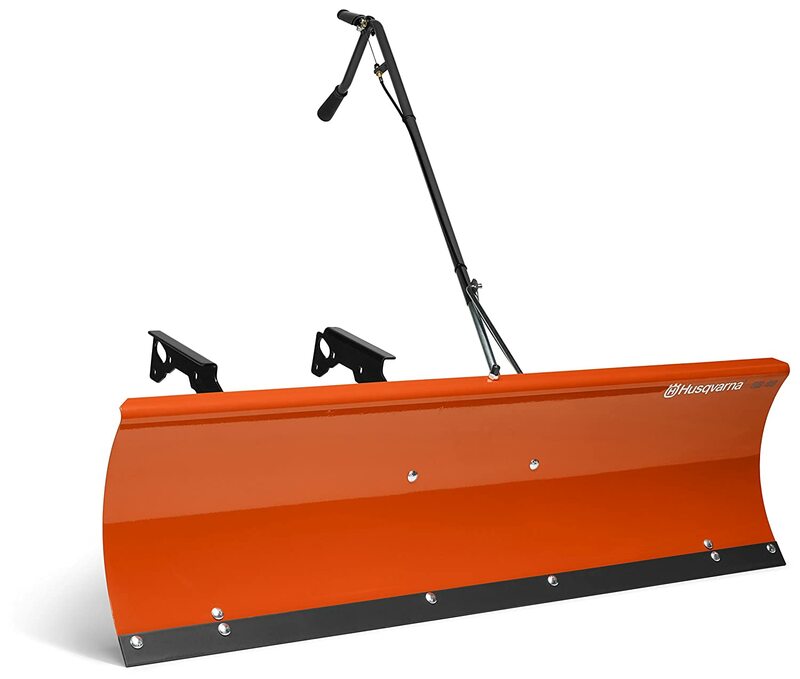 Our second top choice would be the Husqvarna 48-Inch Snow Dozer Plow Blade. This is another excellent choice for lawn mower scraper blades as it’s super easy to assemble and install. Unlike the MTD this blade can angle up to 30 degrees left or right. Independent lifts control to rais and lower the blade from the seat of the tractor is always helpful. Includes a one-time mounting bracket that makes hooking up and removing the edge without the need of tools. Adjustable and replaceable skid shoes and scraper bar are also involved. With a four out of 5 stars on Amazon customers are pleased. Mainly complaining about the initial installation of the mounting brackets other than that are satisfied. We are complementing the ease of lifting, angling of the blade, and overall functionality — another great product from Husqvarna. 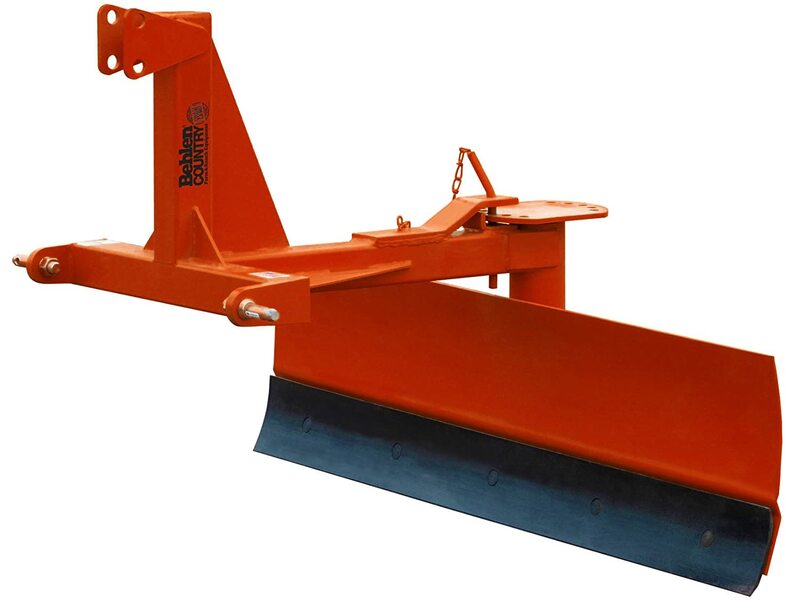 Okay, so we didn’t want to leave out our ATV owners and found the Swisher 2645R 50-Inch Universal ATV Plow Blade. This plow blade is heavy duty construction with extra supports for the tough jobs. Has a unique dual engage inch angle selection system that provides the double lock for plow angle — a reversible and replaceable cutting edge for longer life and plow-saving skids. 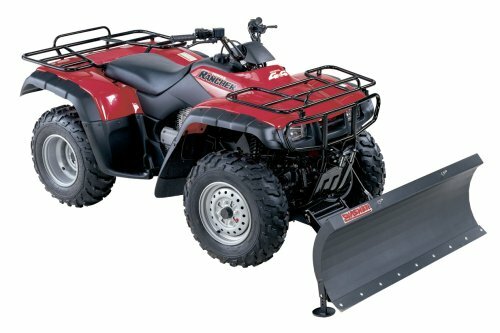 One thing to point out if you are considering this ATV plow blade is that it requires a universal mounting kit. Afterward, though it can be attached and removed in seconds without the need of any tools like the Husqvarna above, you will also need a winch on your ATV to use the plow. Another blade with 4 out of 5 stars. Customers mention how it’s built like a tank and works like a champ — highly recommended for any ATV owners who are the in the market for a scraper blade. A word of caution, the module has a built-in safety feature or stress relief mechanism that tips the edge to prevent damaging your ATV or the mount. As always we would love to hear from you. If you are looking to buy a scrape blade and have any questions, please ask them in the comments below. Already have a scrape blade and want to offer some advice please share it with us in the comments and help us out. Know of another great option let us know about it. The more we know, the better choices we can make and help others.